This is the first photograph ever taken on the surface of Mars. It was obtained by Viking 1 just minutes after the spacecraft landed successfully on July 20, 1976. A Viking Lander proof test article on display in the Boeing Milestones of Flight Hall at the Museum in Washington, DC. These two test rovers and a flight spare represen three generations of Mars rovers developed at NASA's Jet Propulsion Laboratory, Pasadena, California. Front and center is the flight spare for the first Mars rover, Sojourner, which landed on Mars in 1997 as part of the Mars Pathfinder Project. On the left is a Mars Exploration Rover Project test rover that is a working sibling to Spirit and Opportunity, which landed on Mars in 2004. On the right is a Mars Science Laboratory test rover the size of that project's Mars rover, Curiosity, which landed on Mars in August 2012. This artist's representation shows the landing sequence of the Viking landers on the surface of Mars. Each Viking spacecraft consisted of an orbiter and a lander. The Viking 1 lander worked for more than 6 years after landing on July 20, 1976. Viking 2 landed two months later on the other side of Mars, where it transmitted data for over 3½ years. This is the proof test model of the Viking Mars Lander. For exploration of Mars, Viking represented the culmination of a series of exploratory missions that had begun in 1964. The Viking mission used two identical spacecraft, each consisting of a lander and an orbiter. Launched on August 20, 1975 from the Kennedy Space Center in Florida, Viking 1 spent nearly a year cruising to Mars, placed an orbiter in operation around the planet, and landed on July, 20 1976 on the Chryse Planitia. Highlighted in this image is the gas chromatograph — mass spectrometer of the Viking Mars Lander. This is the proof test model of the Viking Mars Lander. For exploration of Mars, Viking represented the culmination of a series of exploratory missions that had begun in 1964. The Viking mission used two identical spacecraft, each consisting of a lander and an orbiter. Launched on August 20, 1975 from the Kennedy Space Center in Florida, Viking 1 spent nearly a year cruising to Mars, placed an orbiter in operation around the planet, and landed on July, 20 1976 on the Chryse Planitia. Highlighted in this image is the camera of the Viking Mars Lander. This is the proof test model of the Viking Mars Lander. For exploration of Mars, Viking represented the culmination of a series of exploratory missions that had begun in 1964. The Viking mission used two identical spacecraft, each consisting of a lander and an orbiter. Launched on August 20, 1975 from the Kennedy Space Center in Florida, Viking 1 spent nearly a year cruising to Mars, placed an orbiter in operation around the planet, and landed on July, 20 1976 on the Chryse Planitia. Highlighted in this image is the antenna of the Viking Mars Lander. This is the proof test model of the Viking Mars Lander. For exploration of Mars, Viking represented the culmination of a series of exploratory missions that had begun in 1964. The Viking mission used two identical spacecraft, each consisting of a lander and an orbiter. Launched on August 20, 1975 from the Kennedy Space Center in Florida, Viking 1 spent nearly a year cruising to Mars, placed an orbiter in operation around the planet, and landed on July, 20 1976 on the Chryse Planitia. Highlighted in this image is the terminal descent engine of the Viking Mars Lander. The long digging arm on the Viking lander, like this one on the Museum's Viking Lander, collected soil for experiments. Viking dropped soil samples into three canisters like these on top of the Museum's Viking Lander spacecraft for testing. Cornell astronomer Carl Sagan stands in front of a Viking lander mockup in Death Valley, California. Sagan helped select the landing sites and plan the Viking missions and was a tireless promoter of the Viking program and related explorations of Mars and other planets. The Viking spacecraft scooped up bits of Martian soil and placed them in a chamber, where they could be analyzed. It was in effect a miniature, automated chemical analysis laboratory. Viking Lander in Boeing Milestones of Flight Hall at the National Air and Space Museum, Washington, D.C. The two-part Viking spacecraft began to unlock the secrets of Mars and fueled public enthusiasm for planetary exploration. This is the proof test article of the Viking Mars Lander. For exploration of Mars, Viking represented the culmination of a series of exploratory missions that had begun in 1964 with Mariner 4 and continued with Mariner 6 and Mariner 7 flybys in 1969 and a Mariner 9 orbital mission in 1971 and 1972. The Viking mission used two identical spacecraft, each consisting of a lander and an orbiter. Launched on August 20, 1975 from the Kennedy Space Center in Florida, Viking 1 spent nearly a year cruising to Mars, placed an orbiter in operation around the planet, and landed on July, 20 1976 on the Chryse Planitia (Golden Plains). 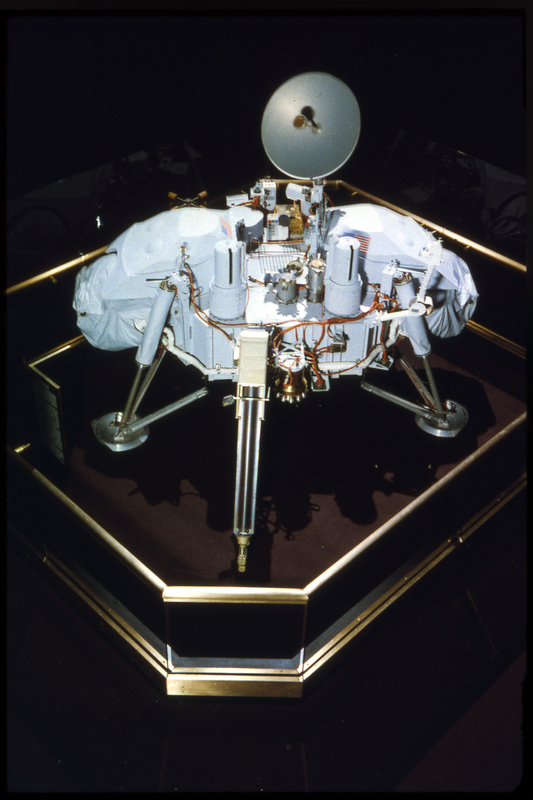 Viking 2 was launched on September 9, 1975 and landed on September 3, 1976. The Viking project's primary mission ended on November 15, 1976, 11 days before Mars's superior conjunction (its passage behind the sun), although the Viking spacecraft continued to operate for six years after first reaching Mars. The last transmission from the planet reached Earth on November 11, 1982. 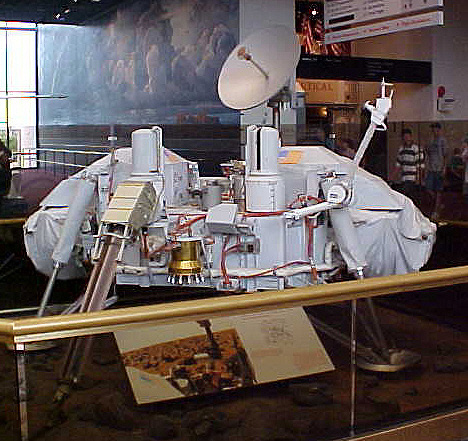 While Viking 1 and 2 were on Mars, this third vehicle was used on Earth to simulate their behavior and to test their responses to radio commands. Earlier, it had been used to demonstrate that the landers could survive the stresses they would encounter during the mission. NASA transferred this artifact to the Museum in 1979. “Life as we know it with its humanity is more unique than many have thought.”—President Lyndon B. Johnson, “Remarks Upon Viewing New Mariner 4 Pictures from Mars,” July 29, 1965. Later spacecraft, especially Mariners 6 and 7, in 1969, reexcited curiosity and laid the groundwork for an eventual landing on the planet. Their pictures verified the Moon‑like appearance of Mars, but they also found that volcanoes had once been active on the planet, that the frost observed seasonally on the poles was made of carbon dioxide, and that huge plates indicated considerable tectonic activity in the planet’s past. Suddenly, Mars fascinated scientists, reporters, and the public once again, largely because of the possibility of past life that might have existed there. The Viking mission that emerged from this excitement consisted of two identical spacecraft, each with a lander and an orbiter. Launched in 1975 from the Kennedy Space Center, Florida, Viking 1 spent nearly a year cruising to Mars, placed an orbiter in operation around the planet, and landed on July 20, 1976, on the Chryse Planitia (Golden Plains), with Viking 2 following in September 1976. These were the first sustained landings on another planet in the solar system. While one of the most important scientific activities of this project involved an attempt to determine whether there was life on Mars, the scientific data returned mitigated against the possibility. The two landers continuously monitored weather at the landing sites and found both exciting cyclical variations and an exceptionally harsh climate that prohibited the possibility of life. Atmospheric temperatures at the more southern Viking 1 landing site, for instance, was only as high as +7 degrees Fahrenheit at midday, but the predawn summer temperature was ‑107 degrees Fahrenheit. And the lowest predawn temperature was ‑184 degrees Fahrenheit, about the frost point of carbon dioxide. Although the three biology experiments contained on the landers discovered unexpected and enigmatic chemical activity in the Martian soil, they provided no clear evidence for the presence of living microorganisms in soil near the landing sites. According to scientists, Mars was self‑sterilizing. They concluded that the combination of solar ultraviolet radiation that saturates the surface, the extreme dryness of the soil, and the oxidizing nature of the soil chemistry had prevented the formation of living organisms in the Martian soil. The artifact in the National Air and Space Museum’s collection is a structural dynamics test article transferred from NASA. For centuries, astronomers had speculated that there may be life on Mars. The Viking missions looked for evidence of present or past life by searching for chemical indicators of living processes. Viking instruments detected many of the building blocks of life but found no conclusive evidence that life ever existed on Mars. Mars is the only known planet that is inhabited exclusively by robots. In the fall of 2014, there were 12 active robots exploring the Martian surface. An additional 9 landers or rovers are dormant or failed to complete their missions. The Viking landers carried the logo of the bicentennial of the signing of the Declaration of Independence. The missions were a bicentennial gift to the American people.